If you learn how to execute the perfect bent over barbell row, then you unlock one of the best workouts for your entire posterior chain; traps, rhomboids, lats, biceps and posterior deltoids. So, what on earth is a ‘posterior chain’? This term describes your complete back – (not just the spine, we’re talking every muscle on your back-side from heel to neck). When a workout like the bent over row employs every link in the chain, the major muscles all come together to maintain your form. So, that means your calves, hamstrings, bum cheeks, lower back, middle back, upper back, shoulders and neck, all work in unison (or a sequence) to help you reach the top of the lift. And because you’re relying on them all, you develop the functional strength we all need in our lives outside the gym. All of this pays dividends when you’re performing ‘normal’ movements in life (like lugging a suitcase through the airport). Beyond this, your posture peaks-out too; so you carry yourself with more confidence in work, at home and especially when you play any kind of sport. And that’s without mentioning how a stronger posterior chain can even help minimise your risk of injury, in anything you do. In case you haven’t worked it out yet – I’m a huge fan of the bent over barbell row. 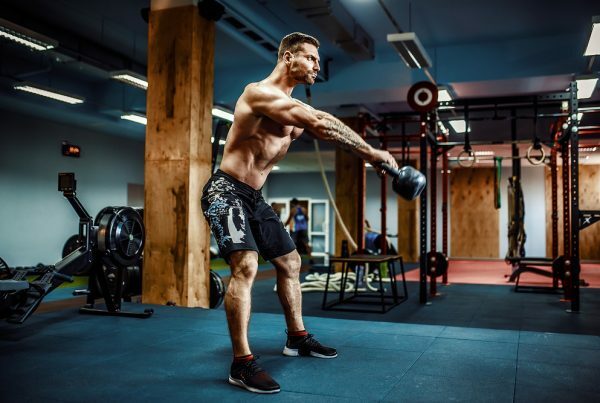 Teamed-up with exercises like the back squat, deadlift and overhead shoulder press – it’s one of the best gears you can crank in any full-body workout programme. You can start off in a rack – or deadlift the weight from the floor. We’re going to focus on the latter here – saves those glares akin to bicep curling in the squat rack. Before we get into it, I can’t stress enough how important it is to recognise your ability to do this workout in the first place. If you deadlift, then you’re going to find this part easy. Slip your feet under the bar so the metal acts as an ‘equator’ across the very centre of each foot. You want it to split them in half from heel to toe (not from shin to toe). Now imagine a vertical line drawn from your shoulders to the floor – you want your feet just a touch outside this line. Tilt your hips forward slightly. Straighten your upper spine and maintain the extension. Sit back slightly, so your hips drop and you automatically bend your knees (again, slightly). Now pivot forward so your bum and hamstrings start feeling the strain of the bend. — Note: If you’re new to this workout or working out in general, then you may notice a significant strain in the back of your thighs. This is a sign that your hamstrings aren’t yet flexible enough to safely take the strain. So, exit the workout and start working on some lower body mobility exercises to develop that much-needed suppleness. Your eyeballs are fixed on a point on the floor directly below your face (not at your feet, hands, the bar, straight ahead, or to the side). Clutch the bar at shoulder-width – with your palms facing inwards towards your body. It’s ALL in your elbows. Breathe out as you drive the points of each elbow towards the sky to lift the bar. Don’t think about your back – or your biceps – or even your fingers. Just take the weight in your forearms and smoothly launch the elbows to the sky like a pair of rockets. Push them back behind you – so your shoulder blades squeeze and the bar kisses your chest. Only push the elbows as far back as it feels natural to do. Don’t force any awkward movements. At the same pace as your lift, lower the bar back down to the floor. Note: Some people prefer to keep the bar from touching the ground – others prefer to let it down completely and start again. I like the former … but I always make sure I’m lifting ‘pure’ – and not relying on the momentum of one lift to fuel the next. This is a gritty workout for your back workout that I use in a series of power exercises. If you’re totally new to this, then I’d recommend learning how to deadlift first. You’re using heaps and heaps of full-body strength here … but that doesn’t mean you can go nuts and start murdering a bar packed full of kilos from the very beginning. Start light. Take it slow. Install the techniques into your muscle memory. And upgrade to heavier weights as you go. The Olympic bar weighs about 20-25kg anyway – empty. So, start without any added weights and familiarise yourself with the form. Final tip: Don’t be worried about people looking at you ‘lifting light’ – nobody actually takes notice and we see the lifters in our local gym helping each other out ALL the time. Form is more important than weight – always. If you’re stuck on any of this or want to know some more about the bent over barbell row, give me a shout in the comments and we’ll talk it through.